Allsang På Grensen: Darin performs "So Yours"
Yesterday, Darin has visited Norway to promote his new international single So Yours. During the Allsang På Grensen show, which was not available to stream outside Norway, he also sang a rock version of his evergreen hit Step Up. Check out the performances right below! Sommarkrysset: Darin performs "Check You Out"
Like last year, Darin took part again the Swedish summer show, Sommarkrysset. This time he performed the fresh newest single from Exit, Check You Out - for the first time in its original mix. If you still haven't bought it yet on iTunes, do it now! Then you can watch the performance right below. 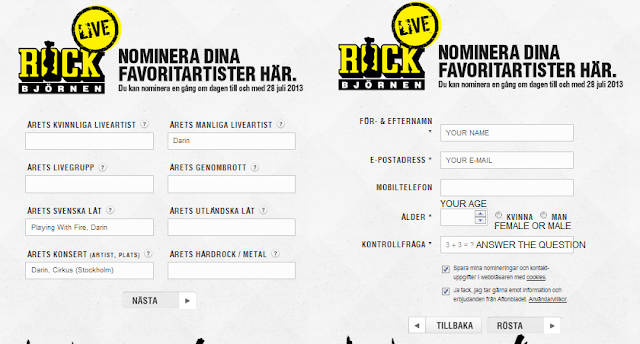 Like every year, fans are given the possibility to nominate their favourite artists for the Rockbjörnen (The Rock Bear), a Swedish music award established in 1979 by Sweden's largest media outlet Aftonbladet. ÅRETS KONSERT(Concert of the year): Darin, Cirkus (Stockholm). You can nominate once a day until July 28. Come on, what are you waiting for?